Smaller Families - but certainly not lesser. This set of wildflowers is "simply" those that belong to smaller floral families - of which there are over 100 families with over 340 species in the Park. The largest family is the sedges (Family CYPERACEAE) with 35 species, followed by grasses (Family POACEAE) with 31 species. However, this website doesn't cover these families - yet. The next most prolific are the daisies (Family ASTERACEAE) with 25 species. 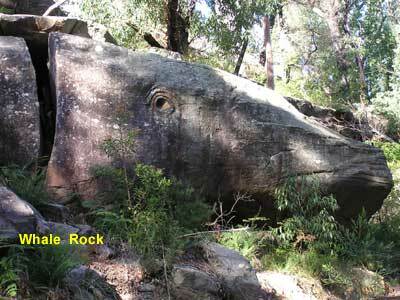 Located next to Devlins Creek in North Epping, Whale Rock is a well known landmark. The Hawkesbury Sandstone formation was also known as Lizard Rock, but Whale Rock is now the accepted name. 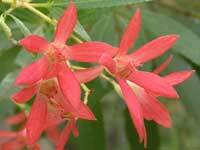 Small summer flowering climber with distinctive flowers and leaves. Tiny blue flowers on a small plant - flowering most of the year, but best in spring. 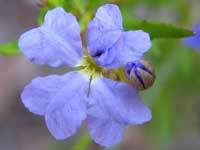 Also see our Blue Dampiera web page. Its lyre shaped bracts provide both its name and its key distinguishing feature. It is an uncommon species. Flowering from early spring, its leaves, although variable, are similar. 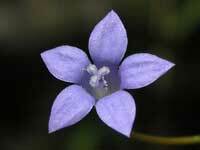 The flower is about 10mm square. 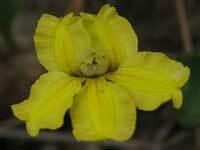 Distinguished from the other members of the Goodenia genus by the lack of leaves on the flower stem. 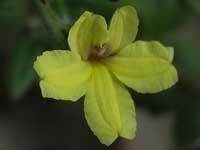 Also known as the Violet-leaved Goodenia, it is best identified by the flower stem coming from a rosette of leaves. It grows along the ground. A tall leggy shrub over a metre high. 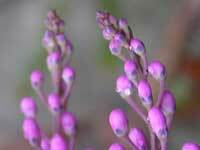 Its mauve flowers appear in spring. Also known as Pyramid Flower, Pink Matchheads and Heath Milkwort. A white form of Matchheads. 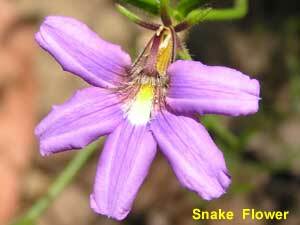 Most commonly appears as mauve. 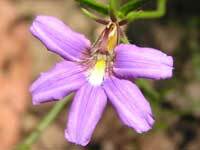 Also a member of the Comesperma genus, this fragile little plant has no leaves. 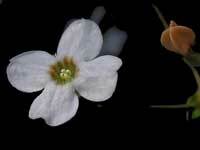 The "wing-span" of the flower is barely 10mm. 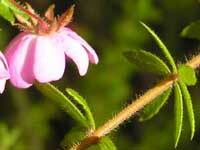 Also known as the Dog Rose, its pink flowers hanging down and its six leaves radiating from the stem identifies it. 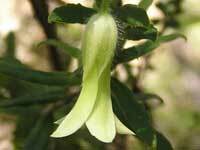 Flowering in spring and summer, it prefers sheltered damp embankments. As the flowers of this plant are similar in size to the pink version (15mm wide), it isn't the much smaller Bauera microphylla whose flowers are less than 8mm wide. With flowers that resemble some of those of the acacia family, this beautiful tree grows over 10 metres high along watercourses. Distinguished at any time by its trifoliate jagged leaves, it bursts into colour in summer. Up to 5 metres high, it is a Christmas joy. 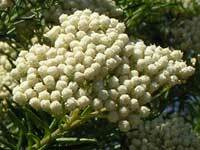 However, the NSW Christmas Bush produces white flowers. Its sepals turn to red in fruit. 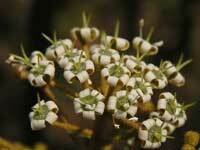 Its 25mm diameter flowers are twice that of its sibling (the Coachwood). Once you can identify it - by its grey bark with white mottles, or its flowers in summer, - you will see this 20 metres tall tree in stands along the creeks of the Park. It was used in early coach making, WWII .303 rifle butts and for the frame of the Mosquito fighter-bomber (an all wood construction!). White drifts on the sandstone ridges in spring. 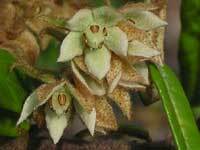 Its flowers are about 50mm wide. 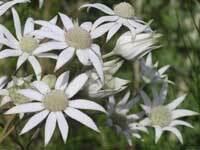 Also see our Flannel Flowers web page. 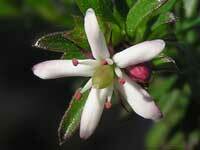 A small plant with flowers up to 12mm across. 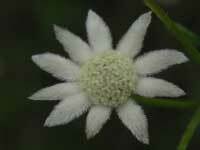 Like its siblings, it doesn't have petals, the petal-like part are bracts. 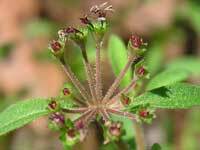 A low bush with leggy stems whose leaves are 5mm long, 1mm wide and pointed. 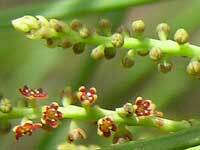 The flower heads are at the end of the stems and have both male and female flowers. 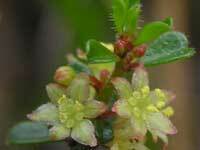 Also known as Scrubby Platysace, the flower head of this summer flowering shrub is about 25mm across. 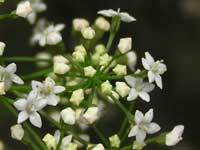 Flowering in late summer, Carrot Tops is best identified by the bouquet of tiny (3mm across) flowers at the end of a long and oblique stalk. A small plant with characteristic "woolly" diamond shaped leaves. A delightful little plant whose leaves have three tips. The autumn flowers droop and are hidden by the hairy bracts. 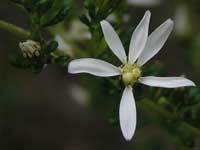 A tree to about 8 metres in height, it has scores of white flowers in spring which progress to orange coloured berries by autumn. 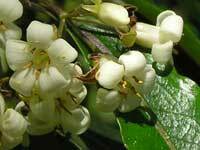 Also see our Sweet Pittosporum web-page. 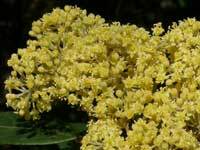 Its yellow flowers and dull leaves distinguish it from the Sweet Pittosporum (to the left). 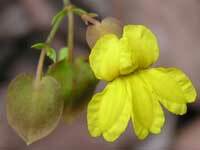 It is also known as Wild Yellow Jasmine. 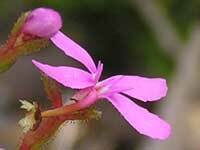 A small plant whose flowers are only 8mm wide. 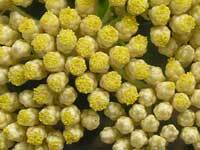 It is also known as Mary's Flower. The thorns of this summer flowering tree become branchlets which bear the flowers. Flowering in spring its 20mm flowers become purple edible fruit. This climber is also known as Dumplings. See NSW Flora Online for more details. 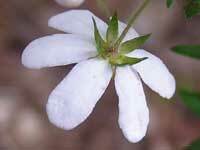 A tiny shrub that can be identified by its trifoliate leaves. 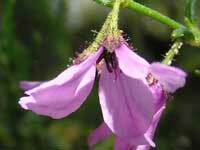 Its male flowers have three anthers. 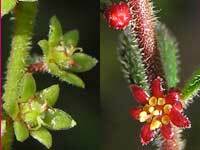 A small shrub whose shiny and hairy leaves are about 6mm long, and are often bent at the tip. The variety that has red male flowers (shown here) only occurs in Sydney's north. 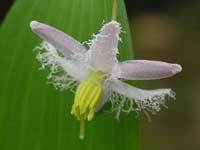 This image shows the cream male flower. 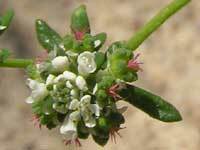 The Thyme Spurge is supposedly monoecious, but I have yet to find a plant that has both male and female flowers. 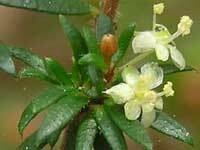 This spring flowering shrub produces female flowers followed by male flowers. The green ball on the above thumbnail image is the fruit. The flowers are around 15mm wide. 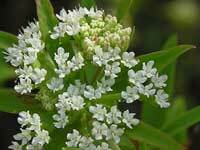 A small plant to about 30cm high, whose flower-heads are held at the end of long branching stems. Its recurved shiny leaves are about 12-15mm in length. 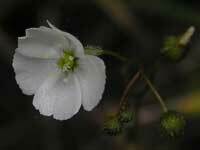 Also called Rice Flower, Sago Bush and White Dogwood. 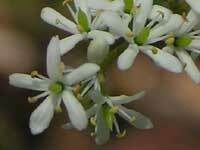 This spring flowering shrub grows to over 2 metres in height. It is very similar to the Bent Cassinia (Cassinia uncata). A show of white 10mm flowers in early spring. Its leaves are tiny. Identified from other members of the Cassinia genus by its shiny green toothed leaves that are recurved and are white underneath (see larger image). The leaves are typically 10mm long and 4mm wide. 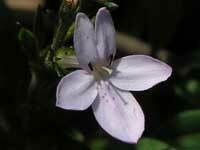 A small plant whose flowers are about 10mm long. 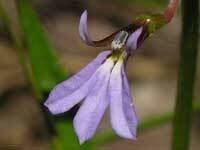 Besides its lobelia like flower, it is easily identified by the pale purple undersurface of its older leaves. 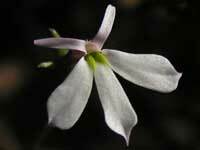 Pretty little flowers, barely 5mm wide, appearing singly on leggy stems. The leaves have two opposite bumps (glands?) half way along. 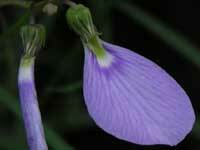 See the Angel Sword on our Blue Mountains Wildflowers web page. 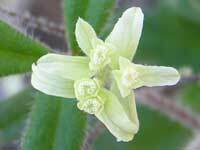 Recognised by its sweet smelling white flowers on grey stalks that come from leaf joints. These flowers are less than 10mm wide. The orange flower bud is shaped like a bishop's hat - which is called a mitre - thus its name. Another stunningly symmetrical flower in close up. 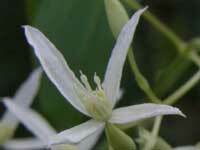 This climber is distinguished from the Forest Clematis by its "toothed" leaves and the long appendage on its anthers. It flowers in spring. It is also known as Traveller's Joy. 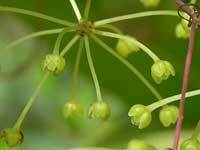 Also known as Headache Vine, it is identified by its smooth edged leaves and the short appendage on its anthers. 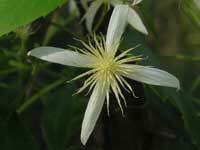 Flowering in late winter, its 25mm wide flowers appear earlier than the Austral Clematis. The seeds of the Clematis are stunning. 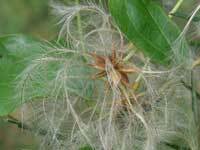 This is an image of the Forest Clematis showing the dozen or so achenes (1 seeded fruit) each with a long wispy tail. The members of the Pomaderris genus are difficult to distinguish - the leaves and the flower colour provide the vital clues. The dark brown hairy branches assist identify this species. 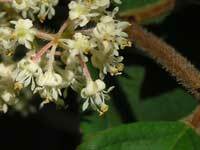 The Tree Pomaderris is initially identified by its 10cm long, non-toothed leaves and hairless top surface. 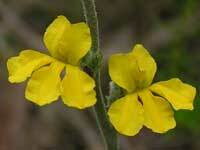 From there, its yellow flowers with petals and the tertiary veins on its leaves distinguish it from P. discolor. 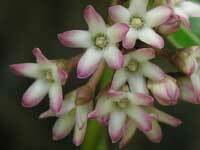 Its flowers are around 7mm wide. 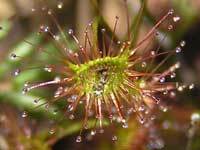 It is also called the Rosy Sundew as its flowers are occasionally pink. Best identified by its 15mm long spatula shaped leaves - and thus its botanical name. One of the most common sundews, it is found in eastern Australia, New Zealand and east Asia. 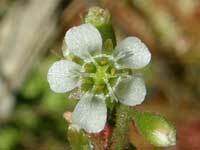 A tiny flower, barely 10mm across, adorns this carnivorous plant. 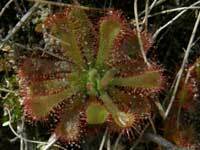 Distinguished from Drosera auriculata (Tall Sundew) by its hairy sepals. The drops at the ends of its leaves are sticky. The "tentacles" close up over any unwary insect. The entire leaf is 10 mm across; the centre 4mm. 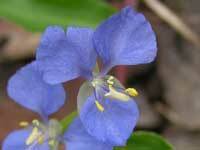 Probably because it is similar to "Wandering Jew", this climber is also known as "Creeping Christian". The enlarged image shows the 1cm orange berries of this climbing plant. 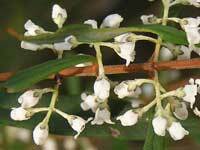 The Wombat Berry is the only species in the genus. 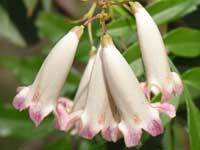 A spring flowering climber, the bell shaped flowers are 20mm long and 10mm wide. Best known for its blueberry like fruit - see large image. 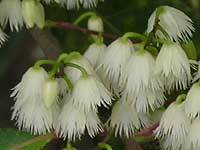 The delightful flowers provide another name for the tree - Fairy Petticoats. Its 3cm wide flowers are glorious in close up. The Royal Botanic Gardens' PlantNET database warns that it is "toxic to stock". Also known as Granny's Bonnet. An unmistakable flower - this one had its photo taken from the top, so it is effectively upside-down. The 15mm flowers appear in summer. 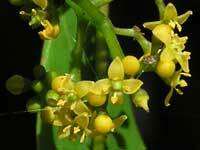 Also known as the native grape, the yellow flowers appear in summer. Also known as the Poison Peach as it is toxic to stock. 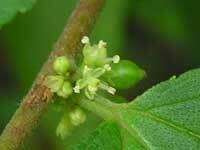 Also known as the Native Currant, the 5mm wide green grape like fruit is shown in the enlarged image. The shrub is broom-like. 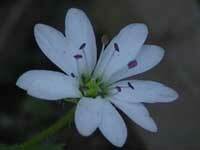 This delightful little herb actually has 5 petals not 10 - each petal being deeply split. Its leaves help identify it. 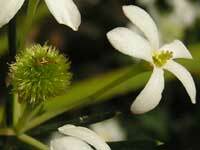 One of its siblings is Chickweed (Stellaria media). 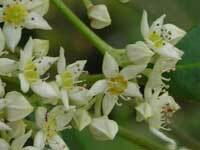 Also known as Sweet Sarsaparilla, this climber is identified by the three veins on its leaves. 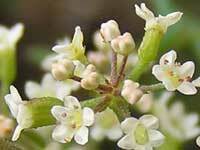 Its tiny flowers become black berries that are about 7mm across. Stunning flowers in close up - which look like a piece of fruit that has been partially cut into slices. Also known as the Rusty Velvet-bush. A small spring flowering plant that's also known as the Common Hemigenia. 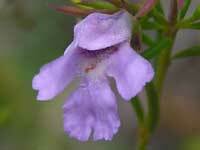 Similar to members of the Prostanthera genus but distinguished by its leaves. The flowers are about 10mm "square". Glorious in close up, each flower is 3mm wide. 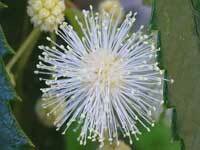 The erect shrub can be over 2 metres tall. 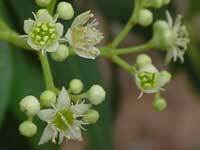 It is a member of the Araliaceae Family which includes the ivy and ginseng. A small flower, in pairs (sibling not shown here). 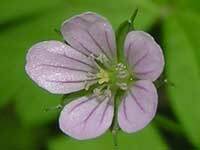 It has a distinctive geranium leaf. This is the only species in this genera. 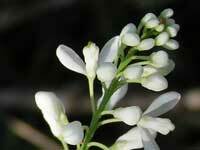 The flower arrangement, produced in spring, has 8-12 stalks, each of which has several flowers. The fruit is retained long after flowering. 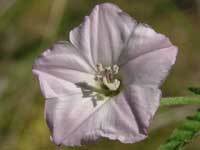 This spring flowering climber is 15mm wide and is also known as Blushing Bindweed. 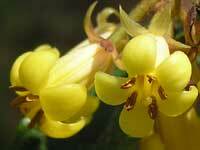 The hammer-like trigger is used to shower any insect that lands on the flower with pollen. Distinguished from similar species by its aerial stems. 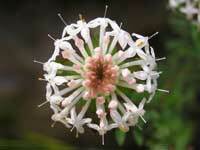 The flower is about 15mm in length. 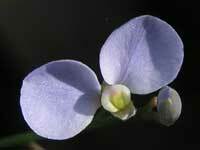 Its tiny flowers (6mm across) distinguish it from its siblings. 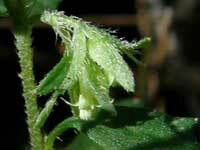 This species is classified as "vulnerable", and is best identified by its "hairy" sepals and stem. The species of this genus are referred to as Black-eyed Susans. 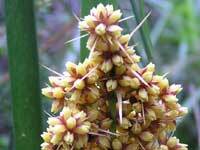 Also known as Honey Reed, both its thorns and leaves can inflict pain. Very hardy and flowers in spring. The genus is called Spade Flowers. This species is also known as Lady's Slipper, and its multiple flowers on each stem, distinguishes it from H. vernonii. Also called Scented Milk Vine, this summer flowering climber is distinguished by its white flowers - the other species are mainly yellow.